Our creams have a thick consistency that will leave your skin feeling soft and smooth. They are made with a combination of goats milk, honey, shea butter, soybean oil, sunflower oil and aloe. 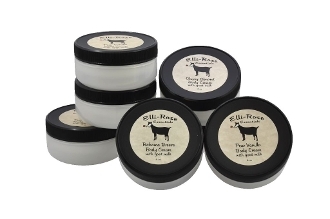 The goats milk acts as a natural moisturizer that will hydrate and nourish your skin. Honey adds a natural anti oxidant and anti inflammatory quality while the shea butter adds extra moisturizing qualities to the lotions and creams.